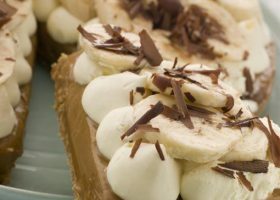 This combination of banana, toffee and cream is popular with all the family and is very simple to make. Banoffee Toffee is sold in most supermarkets – it may be beside the jams or beside baking ingredients. If you can’t find any, place an unopened 400g can of condensed milk in a pot of water, bring to the boil for three hours taking care not to let the pan boil dry. Allow the can to cool completely, open and spread over bananas as described. Preheat the oven to gas 6/200C. Line the flan case with greaseproof paper. Cover with baking beans or uncooked rice. Bake for 15 -18 minutes until golden brown. Remove the baking beans and greaseproof paper. Allow to cool. Slice bananas and squeeze lemon juice over them, toss to ensure they are coated. Place in the base of the flan case. Using a spatula spread the banoffee toffee over the bananas. Whip the cream until it forms soft peaks and spread over the toffee. Crumble the flake and spread over cream. Chill until required.